Yesterday I worked all day on a painting of rocks and mud at low tide. Everything was going well until the end. I basically destroyed it. That's the risk you take with watercolors. I trashed the painting and felt really angry. 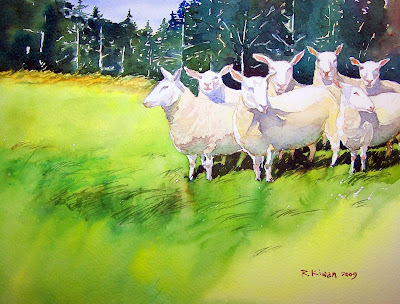 Then, that evening I made a few sketches of these sheep. I woke up today, watched Tottenham my favorite English team. Then I did this painting. Green is the artist nightmare, but I think I tamed it very well. The real painting looks great! The photo doesn't give it justice!! Not only is it time to update the pic..i see these sheep all the time. I love it when they line up to go to the barn!